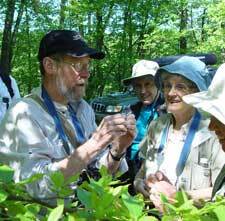 The Vermont Botanical & Bird Club comprises a group of people interested in observing, learning about, and enjoying plants and birds in the varied habitats of our state. Our main activity is an annual meeting, held in June at a different location each year. The four-day schedule of events at the meeting includes early-morning bird walks, mid-day field trips, and informative evening programs — plus an opportunity to socialize and share with others of similar interests. The club sends out an annual newsletter in late winter and a bulletin is published every 2-3 years. The club has also assisted in the purchase of a small but botanically rich area which it then presented to Castleton State College. The original Vermont Botanical Club was founded in 1895 by a group of botanists who occasionally gathered botanize on field trips in various sites around Vermont and New England. The Vermont Bird Club was started in 1901 and the two club merged the following year. Members of the Vermont Botanical & Bird Club include both amateur and professional naturalists from Vermont and surrounding states; membership is not limited to Vermonters. As our meetings are normally held at colleges, the accommodations are comfortable, but not luxurious, and the off-season rates tend to be reasonable. The club's scholarship program enables outstanding students to attend free of charge.